Afterplay, the latest CD by pianist and composer Brian Kelly, debuted at #31 on the Smooth Indie Star Chart on March 23, 2009. Brian Kelly’s latest CD, Afterplay, has ranked #3 on the NAR Top 100 Radio Chart in January 2009. Afterplay, the new CD by composer and pianist Brian Kelly, continued to hold the #3 position on the NAR Top 100 Radio Chart in December 2008. Brian Kelly’s new album, Afterplay, ranked #3 on the NAR (New Age Reporter) Radio Chart in November 2008. My Afterplay album is being promoted to radio stations worldwide November thru December 2008. On my website I’ve posted an interactive Google Map which shows the radio stations that are currently (or will soon be) playing the CD. Brian Kelly’s Pools of Light CD has ranked #1 on the NAR radio chart for two consecutive months: June AND July 2005! 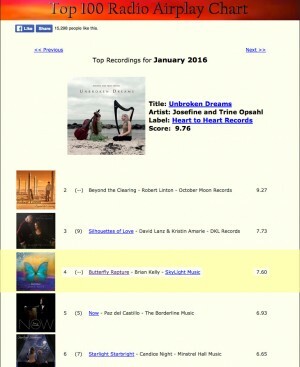 Brian Kelly’s Pools of Light CD is #1 on the instrumental music radio chart! After one month of promotion to radio stations around the world, my CD, Pools of Light, entered the New Age Reporter (NAR) charts at the #1 position for June 2005.